Keeping track of technological advances could allow OH professionals to realise several efficiency improvements, says Nic Paton. It may have been driven by understandable concerns about patient confidentiality, consent and data security, but, historically, occupational health practitioners have not been fast out of the blocks when it comes to technology. Even as recently as a decade ago, it was not uncommon to find OH units that were barely computerised, with many GP practices and NHS hospitals not much better. Thankfully, just as technology has been transformed in the past decade, so occupational health practices and processes have been playing catch-up and are now changing out of all recognition. Technology is creating “paper-lite” or even paperless processes; information and records are increasingly accessed and managed through secure portals, while functionality and responsibility are being passed back down the chain to the manager and employee. Remote, mobile and 3G technologies are promising even more profound change going forward. What is more, in the current straitened financial climate, the “added value” of technology in terms of process efficiency and evidence of return on investment is becoming a key selling point for occupational health practices when it comes to contract negotiations, securing clients or developing new relationships. “Being able to show the value you are providing, or even the added value, is becoming much more important,” agrees Simon Wheeler, director at Warwick International Computing Systems, a key OH technology provider supplying the Opas system, along with names such as Tempus (which supplies the Cohort system), Chi Systems (which supplies the Orchid system) and Medgate. Dr Paul Nicholson, associate medical director, EMEA Beauty and Grooming, Procter & Gamble, points out that the new Safe Effective Quality Occupational Health Service (SEQOHS) accreditation and quality management system is a “technology-enabled” process with most of the accreditation done remotely. It is clear that the process lends itself to automation. 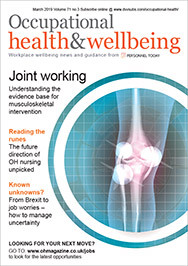 Dr Richard Preece, consultant in occupational medicine at Mid Cheshire Hospitals NHS Foundation Trust and columnist for Occupational Health magazine, is among those moving towards a “paper-lite” structure. “We have integrated our OH system across all venues and all new records are electronic. We will put all correspondence in the system soon, too. We also use text message appointment reminders,” he explains. In Scotland, meanwhile, an online management referrals pilot was rolled out across the country last year, with the £44 million patient management system enabling staff to keep better track of patient records and share information more easily with GPs. Key advances enabling OH practitioners to increase efficiency and automation include touch-screen registration to notify if someone is waiting, SMS text messaging to cut down on “did not attend” (DNA) appointments, integrating online sickness absence recording into online management referral and voice-recognition software, says Jo Henderson, account manager at Tempus. Other innovations include the increasing popularity of digital pens. “By using online modules [OH practitioners] can then also run health promotions based on trends that have been picked up from the results of our health surveillance system. By using a lifestyle assessment system, such as our CALM system, they can report on an individual’s fitness, nutrition, stress and general lifestyle, as well as provide group reports for employers. By providing a service based on the outcome of the lifestyle assessment they can encourage companies to use occupational health that might not have otherwise done so,” she explains. One of the key challenges for OH is IT departments – and the wider business – too often failing to recognise the importance or necessity of their IT requirements, Henderson contends. “OH is nearly always lacking in IT support because of people’s lack of understanding as to what OH is,” she adds. Technology is increasingly passing “ownership” of workplace health back down the line to managers and even the employees themselves, argues Graham Johnson, clinical lead-nursing at Bupa Health and Wellbeing. “Where it might once have been a referral form passing from the manager to HR and then to us, now the manager completes a form online and wings it straight to the clinician or provider. So it is much quicker and there is a closer relationship with the manager, it gives them more of a role in the process. “We have also been introducing systems that give managers the opportunity to score reports that come back to them – so it is an instant auditing process. We have also been developing a quality management system where we can audit clinicians and managers can give feedback,” he adds. But, as the saying goes, technology is only ever as good as the people using it, which means that however advanced the system, if the line manager is still a weak link in, say, the recording of absence, it is still going to be a weak system, cautions Mark Simpson, medical director at AXA ICAS Wellbeing. “Even if you have good technological solutions, it can be a major mindshift for organisations to rethink how they are going to tackle absence management more effectively. Even with the best technology, the line manager can still be the limiting factor. So it is often about needing to change the mindset not just changing the technology,” he points out. “When it comes to absence management and absence recording, more often than not this is something that will still go straight through to an HR or payroll database,” adds Wheeler. “What this can mean is that, understandably, the clinical interpretation that can be put on this data can be poor. So what we are also finding is that OH practitioners are becoming more proactive and downloading the data directly themselves from HR, so they can apply an effective clinical interpretation and, therefore, better intervention and case management,” he continues. Moreover, you still cannot assume when you go on site that you will automatically have internet access, even with 3G. That is why at Atos clients will be set up, if they need it, with an ADSL line, broadband or 3G connectivity, explains Dr David Wright, chief medical officer at Atos Healthcare. “It is part of the negotiation with the customer. What we try to do within OH is to have a paperless system. It depends on the customer, but ideally referrals will be done electronically; we are now encouraging people to refer through a web portal. The clinical notes are electronic too, but they are not held on the computer, it will always require a connection to log in,” he says. Data security is, of course, an issue of paramount importance within this context. “Nothing is left on the laptops, so if a laptop or tablet computer is lost or stolen no clinical data is stolen with it. We do not use USB memory sticks or external hard drives for any storage,” stresses Wright. Another issue driving change for OH practitioners is the transformation we are seeing within the public sector (traditionally one of OH’s biggest customers), with greater sharing of back-office technology infrastructure, greater integration of systems and greater cross-functional working. All of these issues pose challenges when it comes to managing technology, with OH potentially providing completely different services to quite similar employers and now needing to integrate the technology together. So systems have to be flexible enough to adapt, argues Ingolv Urnes, founder and principal of provider psHealth. “The truth is that OH providers have historically been very poor at process transparency. But the convergence of secure internet portals, whether fully hosted or, increasingly in the future, through cloud computing, is making things much more doable. Being able to provide your clients with secure online referrals is becoming more the norm, more expected,” he says. Technological innovations such as smartphones and tablet computers are also going to play an increasingly important role within occupational health, Urnes predicts, and we are already starting to see more health surveillance applications coming on to the market. “We, for example, now have a solution that is not dissimilar to Facebook where you can exchange messages with fellow case managers. Subscribers can pick it up and discuss a thread,” he points out. “For me, without a shadow of a doubt, it is mobile computing that will be huge, for health in general, although the security issues associated with it are not trivial. So it is not just about the technology, it is about having more tightly controlled processes and protocols so that everything happens within the system. Technology enforcing better protocols, however boring that may sound, is, I think, going to have a huge impact going forward,” adds Urnes. Employees may even eventually have electronic “health passports”, which they would take with them between jobs as a portable record, forecasts Johnson. “In the long term, when you are facing demographic issues such as an ageing population, shrinking workforce and more people working with chronic diseases, technology will be increasingly helping organisations to work more effectively. If you can have an electronic interface directly from the health-screening activity, it makes things much more efficient and potentially improves the security,” he says. Revolutionary changes such as these are still a way off, agrees Mills, but will come along at some point. “I do think the next 10 years will be the decade when the electronic health record becomes something we own as individuals. Rather than it being something we leave to our GP, it will be something that we share with GPs, hospitals or, if we have access to it, occupational health,” he says. There will probably be more use of telehealth technology and remote consultation and more use of innovations such as biosensors that you plug into your mobile and upload, say, your blood sugar levels or peak flows and feed them back to a nurse or physician. Similarly, technology could lead to a revolution in how health in the community is managed by GPs that could, in turn, change how OH works and is viewed. “Traditionally, when it comes to health, GPs have waited until a patient comes to them, knocks on the door and then they fix it. With technology there is the ability to be more proactive, to go out and collect information about health risk, amalgamate that with GP records and really start to identify individuals who might be at risk and target them before they have, say, an expensive heart attack,” says Mills. But, for now, it is the competitive edge that effective technology can give that is probably its greatest attraction for many OH practitioners, argues Wheeler. “It is about being able to show to the organisation what interventions work most effectively and how best to target your OH resources – all of which technology is becoming crucial for. Everyone, without exception, is being driven very hard at the moment in terms of efficiencies and cost savings, and the use or maximisation of technology is a key part of this,” he explains. More effective use of technology has led to a 50% improvement in capacity in some areas, points out Chris Woon, service director for Working Well, an NHS Plus unit based at the 2gether NHS Foundation Trust, a mental health trust based in Gloucester. An NHS occupational health provider for more than 30 years, the unit has been steadily branching out into more external work and now has private and public sector clients in a wide range of sectors, including agriculture, hotels and catering, transport, education and finance, with information and technology becoming a much more important key performance indicator, he suggests. “Technology has been one of the key pieces of the jigsaw that has allowed us to focus much more on customer interaction and improving our service and our interventions, and we can offer much more meaningful and robust management data and information, something that has been a key element of the Dame Carol Black reforms,” Woon explains. Working alongside provider Warwick International Computing Systems, innovations have included linking the electronic staff record to the department’s database (therefore providing much clearer information on relative sickness absence) and touch-screen registration. There is also a range of online policies, forms and guidance documents that can be downloaded. Appointment reminders are sent out by text message, pre-employment forms are online and the unit is piloting voice-recognition software designed to replace manual dictaphones, where the user speaks into a computer, the information is saved to a digital file and then automatically transcribed. “Technology has removed a lot of the more mundane activities – the need, for example, to spend time pulling out notes in the morning. Being able to prove value for money at the moment is a key way of sustaining your client portfolio, as well as attracting new ones. We cannot sit back and let the world change around us,” Woon says. “Missed appointments have halved from 25% to 30%, to 10% to 15%, which could still be improved but is a significant change. If you are saving on half your DNAs [did not attends], it means you are seeing more people, which means you are driving up new income from external sources, as well as meaning you are probably seeing more people more quickly,” he adds.